Hi, folks. I suggest you go through your settings, and check them. I had to re-enable Remote Management, so there may be others that have been changed in the new version. If you have to re-activate just go to Help/Subscription Status in the UI, and just make sure it's synched with the servers. Also, as it was posted in separate thread here, Some of Norton Security configuration settings have been changed without my consent. Under Administrative Settings, Norton Community Watch was switched on. That is definitely not what I want to be turned on! Also I found Remote Management changed to OFF, the removal of both Non-Admins Access to Settings and also the Product State Monitoring option. Also the Disk Optimization under Tasks was turned ON and as a result after getting through the trial expired, I had to let Disk Optimization run to clear the error and then I was able to clear the check mark from that Task. One more thing, it appears not many functions work from a non-admin account. This is on a Win7 64 Bit desktop and also on a Vista laptop. Also I found Remote Management changed to OFF, the removal of both Non-Admins Access to Settings and also the Product State Monitoring option. Where is/was Product State Monitoring...? Sorry for butchering the other thread, but I wanted to separate this issue. @bjm_, @yank, @GoneWild, @FattiesGoneWild, @F4E - if your settings have changed, please post some screenshots of what has changed, along with exactly what you expected. I need a bit more detailed information to give to our teams, like what type of account was logged in, what the setting state was in 22.2, and what the setting state is for 22.5. I apologize for the request - it will make it much easier to reproduce if we know what we're looking for. Thanks. Remote Management in Administrative Settings change from ON prior to the update to OFF (which is by the way the Default setting) which means I lost my setting when updated - retain the settings as it does for NRnR tool did not work as expected. The Non-Admins Access to Settings and the Product State Monitoring under Product Security on the Admin Settings page were deleted. They were present prior to the upgrade and are missing from the options after the upgrade. Under Task Scheduling, prior to the update I had unchecked Disk Optimization, after the update I found it check marked and even threw a RED X as being needed. Once again Disk Optimization check marked is the Default Setting, thus retain my previous settings once again failed. I was in fact surprised to find my Antivirus Boot Time Protection setting remained @ Aggressive - even though the Default is OFF. It appears this setting was retain through the update. I was on an admin account all the time. I really don't see how screenshots of me changing my settings (to show you what it was after the update) as compared to what it is now and was before the update would help any? BTW, my Install Logs have been sent to Gayathri_R. Wonder why Vista v22.2 and W8.1 v22.5 cannot find 'Product State Monitoring'. I can't find it with windows 7 version 22.5 cannot find that either. I don't remember if I had that with version 22.2. I believe Product State Monitoring was removed with v22. Are you saying that with all of these settings, after updating to 22.5, community watch is turned ON, but all the other settings are fine? Our team is able to reproduce the settings changes that you all are seeing. We're working on it now. Thanks for the great info! "Are you saying that with all of these settings, after updating to 22.5, community watch is turned ON, but all the other settings are fine? " - Yes. FYI, I just did the NRT / re-install trick and the Check for New Version option is back again. I still have my local vault too. tony, what about retaining local vault? i turned my win7 machine off after reboot loop and ns not working and have not turned it back on(friday morning). thanks for your help. Protection Updates: is showing date now.... guess it took a day to settle in. Did Non Admin return also or was that removed by Design...? Did you CP Save Settings or just NRT ..? Just NRT > Norton Management > Re-install. Did Power Source return for Background Tasks or was that removed by Design..? SUBSCRIPTION STATUS: Active with 22.5 ~ Subscription Status: 123 Days Remaining w 22.2 It is old NS's feature. I just got some more information regarding the Subscription Status message. ​If the customer is not enrolled Automatic Renewal and he has days > 365, Subscription Status will be shown with link "Active" and customer will see the days remaining by clicking the Active link. If the customer is not enrolled in Automatic Renewal and he has days <= 365 days remaining, he will be shown the number of days with the Renewal link. Clicking that link will allow him to renew the subscription. If the customer IS enrolled in Automatic Renewal, only the "Active" link will be shown. This is an effort to reduce the clutter of information shown, and since the customer will be automatically renewed when the subscription approaches expiration, that expiration number is moot. As Krusty13 mentioned Check for New Version returns. Non Admin and Power Source are still MIA. Unless, I hear to the contrary. I'll presume Non Admin and Power Source are missing as per design. Non-Admin access to settings was removed intentionally. It is a security loophole that enables non-privileged users to access privileged product configuration. * and Power Source ... ? Thanks for your interest and info. Thanks -- I have been wondering why I couldn't access my settings anymore. I've just remade my Windows 10 10130 TestBed and was about to install NSBU. AMOI Does any of this alter access to My Norton Account? Um, I noticed Performance Monitoring > Program Exclusions have these (pre) loaded. And there's no Default on that page. So, if they're removed no way to Default them back. Never looked as I recall. So, they may have been there all along and I just never noticed. That is what I suspected might be the case. Personally, I still rather see my remaining days instead of the Active link. With 1100 + days, I fall into #1. "I also have always had Auto Renewal disabled, and I liked to see the remaining days promptly visible in the UI while now it just says Active and I have to go through the server check routine to have this information. I don't like this change which I consider just a useless waste of time." I'm sorry you consider this change to be a useless waste of time. I think it's a rather minor issue, and given the rules outlined above, will still give you the information you want, just not until you've reached 1 year remaining for your subscription. That said, I've noted that customers are not happy with the UI changes regarding the Subscription Status. It has been, and will continue to be, the topic of discussions. Thanks. Indeed, it is a minor issue however I’d be pleased if I could again always see the total remaining days in the UI, whatever they are. Until today I still had number of days, as others I do not like the stupid change why change something for no reason than changing it for the worse! I suspect that it has to do with attempting to reduce (economize on) the amount of client to server "chatter" communication. Notice too that the account (logged in) indicator in the upper-right corner of the GUI has also changed from showing the Name on your account to simply showing your email address? In order to show your Name (as it did before) it would also require "transacting" with the Norton servers in order to retrieve the Name on your account for purpose of that display. I'm guessing that the email address on the upper right probably has something to do with the SSO also since you have to sign into your Norton Account with your email address also and not with your name. You only get to see your name once you are inside your Norton account. Of course it doesn't. It only explains that you think certain customers do not have this right of access to information. so to reduce clutter, you add two different links because you think people like to click instead of just able to see info. clicking on Active or Help > subscription Status returns nothing additional. What is the point of these links if they do not supply desired info to specific people who have been singled out as not having this right to information. Are you - Norton - saying to all customers who use the auto renewal to stop that option and turn it back on when the date for renewal draws close if you want the same information as everyone else, because that is ridiculous? I do not expect to be treated second class - in fact it's offensive and I do not expect to jump through these crazy hoops to satisfy a designer who does not know what the customers want or need. re :that expiration number is moot. That is not for you to decide. From my point of view it is not moot. And required information is not clutter especially if you have created a link to display it, but the link fails to do this. Just to add for clarity, auto renewal customers may have a greater number than 365 days, I currently do and I can calculate it, but I shouldn't need to do it. It is also reasurring to know that Norton has the correct data displaying preferably on the main UI or at the very least via the additional links. Fair enough. Thanks for your comments, @toadhall. I appreciate the feedback. Hi, blue50moon. Don't forget that Windows 8 needs to be completely shut down for Norton to properly operate. 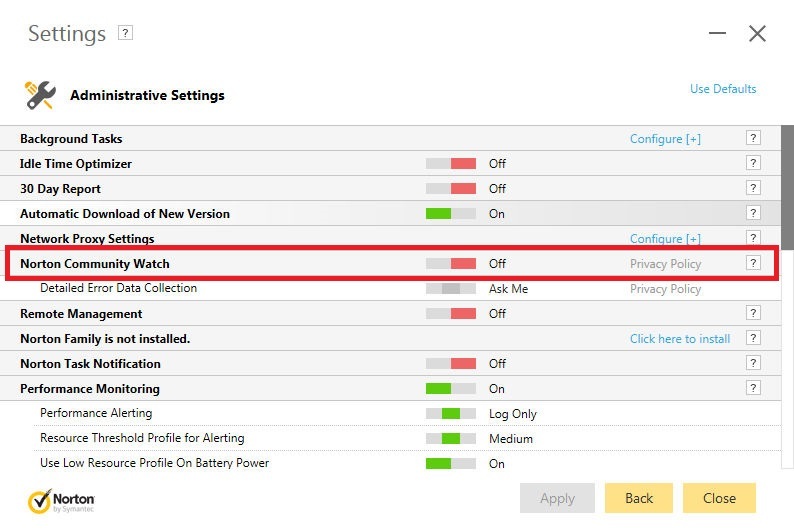 Also disabling Fast Start is suggested, as that can also cause problems. Setting Boot Time Protection to Aggressive, also ensures Norton loads before anything else.